After decades of failure, will metro Detroit pass mass transit this year? The failed attempts to get effective regional transit in Metro Detroit can be measured in the double digits, according to Conan Smith of the suburban advocacy group Metro Matters. By his count, 2012 legislation establishing the Regional Transit Authority of Southeast Michigan (RTA) was the 24th plan since the 1960s. The 23 previous made either some or no progress before eventually dying in Lansing, Washington, D.C., or elsewhere. There were two iterations of DARTA, or Detroit Area Regional Transit Authority. Both were killed, one by veto pen, the other by judicial gavel. Yet another authority was plagued by governance issues and ultimately dissolved by the legislature. Today the region has SMART, the suburban bus network, with spotty service vividly illustrated last year by the viral story of Detroit’s “walking man,” James Robertson, who like countless other lower-wage Detroiters had trouble finding transportation networks to get them to jobs, which are often in the suburbs. Maybe the 24th time’s the charm. A lot of Detroiters, suburbanites, business owners and other advocates for a true regional transportation system hope it is. Public transit hasn’t had an easy time of it in southeast Michigan, not since the social changes of the past century dovetailed to drive commuters off buses, streetcars and trains and onto freeways, nearly all in privately owned cars. The reasons for mass transit’s failure in metro Detroit are numerous, but can be sorted into two categories familiar to local residents – poor relations between cities and suburbs, and concerns over costs, mainly. Sometime in the upcoming months, the RTA will issue a new master plan to develop and coordinate public transit in the four-county area it encompasses – Wayne, Oakland, Macomb and Washtenaw. Although details are still under wraps, it will include bus rapid transit lines running on spoke-like routes from downtown Detroit along Woodward, Gratiot and Michigan Avenues, as well as enhanced service on some crosstown routes as well. Buses from the Detroit Department of Transportation and SMART will carry riders between those trunk lines. A link between Detroit and Ann Arbor is also anticipated. And there will be a millage proposal, a property tax increase for the four-county region, to pay for all of it. No amount has been set yet, but most expect it will be around 1 mill, or $1 for every $1,000 of state equalized value (50 percent of market rate), which if passed would raise, in the four-county area, about $150 million, said Smith, enough to trigger additional federal funds and go a long way toward jump-starting the region’s belated transit plan. That, he said, is what doomed public transit the first 23 times: A failure to get public officials in the city and suburbs to align their interests in a mutually agreeable way. The current RTA stands on more solid ground, crafted to distribute funding as equitably as possible among the four counties while still recognizing that the urban core of Detroit has the most need of immediate investment. Detroit’s recovery. The city’s successful exit from municipal bankruptcy left behind a cloud of optimism, tempered with the realization that without access to employment opportunities for Detroit residents, many of them low-skilled, there will be no significant recovery for the city. Detroit’s spotty bus service has been upgraded post-bankruptcy, but still, most Detroit residents’ jobs are outside the city, and a quarter of its residents do not own cars. To get to work, residents need reliable public transit. What is bus rapid transit, anyway? A modern, high-capacity bus, often articulated (bending in the middle) that, with the right supportive infrastructure, travels as fast as a light-rail line, at a fraction of rail’s cost. BRT vehicles are designed to run on city streets in their own, dedicated lane, stopping at platform stations spaced more widely than existing bus stops, where passengers board at multiple open doors, having paid their fare ahead of time at kiosks, or online. They may run with synchronized traffic signals as well, all of which adds up to fewer, shorter stops and faster travel than conventional buses. What’s the advantage over light rail? Cost. You can run BRT on existing city streets, although dedicating a lane and building platform stations – raised to facilitate boarding by the disabled, who don’t need ramps or for the vehicle to be lowered – carries infrastructure costs beyond the vehicles themselves. 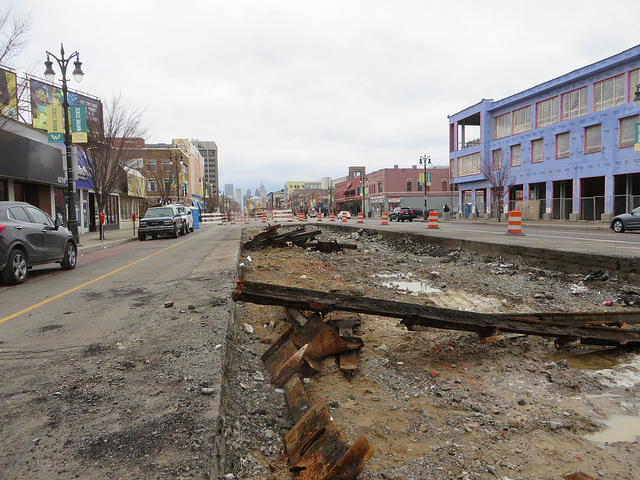 But it’s still far less costly and time-consuming than digging up pavement to lay rails, as anyone who’s watched the ongoing M-1 Rail construction on Detroit’s Woodward Avenue can attest. There’s also an adaptability advantage; if street work needs to be done on a BRT line, the vehicles can be easily rerouted, where a train would be stopped, literally, in its tracks. What cities have BRT now? Many internationally and a few in the U.S. – Los Angeles, Las Vegas, Boston, Kansas City and others. Probably the closest equivalent to southeast Michigan is Cleveland. Generational shifts. Younger people nationwide are voting with their feet, moving into city centers and using the transportation mix more densely populated urban cores require, one where cars are only one available mode, along with buses, light rail, ride sharing and bicycles. Better-educated young people, the future of an increasingly knowledge-based workforce, are looking for robust transit as they look for jobs. At the same time, older baby boomers are retiring and opting to “age in place,” i.e., in their own homes, for as long as possible. They recognize they will likely not be able to drive in their final years, and want reliable transportation to shopping, doctors and other destinations. Environmental concerns. The drive to lower carbon emissions and greenhouse gases now has an international agreement behind it, and general awareness is high enough that some are opting for electric cars and changing behavior to reduce their own environmental impact. Using mass transit is part of that strategy. Work technology. Commuting is dead time behind the wheel of a car, but a transit commuter on a wifi-enabled bus, or even with the ability to create their own mobile hotspot with a cell phone, can get work done on the ride. All of these are ticked off by Paul Hillegonds and Michael Ford, chairman of the RTA board and its CEO, respectively, as they discuss the future of transit in southeast Michigan. Ford was lured to Detroit from Ann Arbor, where he helped expand that city’s system to include Ypsilanti and Ypsilanti Township, and previously worked for the Portland, Ore., transit system. Hillegonds is a former speaker of the state House of Representatives, led Detroit Renaissance (the predecessor to Business Leaders for Michigan) and now works as head of government relations for DTE Energy. Hillegonds points to a Brookings study that says the Detroit metro region has one of the longest median job commutes in the country among major metro areas. “And the current transit system doesn’t make it easy,” he said. Many transit riders could testify to that. Megan Owens, executive director of Transportation Riders United, rides the bus to her downtown office from her home in Hazel Park. But the bus runs only every 45 minutes and, if she misses a connection at the old state fairgrounds transit center, she can find herself facing an hour-long wait, as she did one bitterly cold morning last February. Owens has options, though. She called her husband to pick her up. Most riders don’t. For employers like Jackie Victor, CEO of Avalon Bakery, in Detroit, better transit is something she wants for both the city and her workforce of 65, spread across three locations. And among the 4.2 million residents of the four-county area, most still probably won’t use a new system. But the state law establishing the RTA requires that, should a tax be passed, 85 percent of monies collected must be spent in the county from which it came. There’s also a no-opt-out provision; one major criticism of the current SMART system is that individual communities can opt out of the system, leading to vast holes in service. Under the RTA, that would be disallowed. The idea behind the 85-percent rule is to make sure that while every community in the area won’t get bus rapid transit, all will get something, Ford said, including “paratransit,” in smaller vehicles that travel into neighborhoods, transporting the elderly and disabled on door-to-door trips. Southeast Michigan is not only the center of the domestic auto industry, it’s a place that grew hand-in-glove with cars and the freedom they offer. And for most commuters, cars work just fine. So a big part of the RTA’s work will be to convince voters that the area still needs effective public transit. In that task, they’ll have the help of the Kresge Foundation and the Detroit Regional Chamber, which plans an educational campaign sometime between the announcement of the master plan this spring and the millage vote in November. Because of its nonprofit status and mission, the foundation won’t be advocating for a particular vote, or even the master plan. But the public needs to be informed of what the lack of an effective system does, and doesn’t do, for the region, said Laura Trudeau, managing director of community development and Detroit at the Kresge Foundation. “We’re losing our young people to other regions with better mass transit,” Trudeau said. The foundation has recognized the region’s transit challenges for a decade, and of the 30 largest cities in the U.S., Detroit has the least capacity and dollars spent, she said. But the largest issue, according to Trudeau, remains an unnecessarily burdened workforce in the city of Detroit, who find getting to their jobs outside the city expensive, stressful or even impossible. “The disconnect between jobs and people, where they live, is a problem,” Trudeau said. Gerald Poisson doesn’t want to be the fly in the ointment. He said the region could benefit from a beefed-up system, including Oakland County, where he has served 11 years as deputy to County Executive L. Brooks Patterson, a longtime critic of some regional transit plans as too expensive and not much use to Oakland County residents. The county administration, Poisson said, has been supportive of realistic, cost-effective plans for years. But in Oakland County, fiscal prudence is a mantra, and remember those aligning stars? Not all of them are bright and twinkly, he suggested. Former Battle Creek mayor, state senator and U.S. representative Joe Schwarz puts it this way: “The wise and appropriate and correct public servant, when faced with (constituent concerns about public investment), tells them we have to do it.” Schwarz isn’t in office any more, so he can say that. But he also advised the governor’s office on railroads for a while, and helped with the state’s 2011 purchase of roughly 145 miles of rail line between Kalamazoo and Dearborn. That’s the same line that many hope will eventually carry passengers from Ann Arbor to Detroit on an RTA train, perhaps as many as three or more a day. Schwarz said rail travel could be easily restarted between the two cities, and should. “For cities, even if you are not likely to use expanded transit, it’s valuable to our communities,” she said. “It helps people get to work, and it’s a huge economic growth factor. People who benefit directly are only one step away from those who use it.” Whether the time is right is an open question, but if it isn’t right this year, under the RTA law, it’ll be two more before the RTA can propose an alternative. Say the millage request is cursed by bad timing, and fails. What then? Gerber admits there is “no plan B.” The status quo would have to do, while the way people get around would continue to evolve, maybe not here, but elsewhere. Susan Zielinski is managing director of an entity also known as SMART, this one at the University of Michigan’s Transportation Research Institute. That acronym has nothing to do with the suburban bus system, but stands for Sustainable Mobility and Accessibility Research and Transformation, informally known as “mobility management.” Zielinski studies the way people get around urban environments around the world, and it’s a lot more complicated than a choice of cars or buses. Today’s urban-core resident is “multi-modal,” traveling, in the course of a day, by bus or train, bicycle, cars or their own two feet. Short-term car rentals like Zipcar, ride-sharing via Uber or Lyft, and bike-sharing services all play a part. Smartphone apps with GPS make trip-planning seamless, and “it all becomes one system, the way your phone, your laptop and your printer all talk to one another,” said Zielinski. Privately owned cars are still very much a part of this, but a lesser part. And as the world’s economy continues to coalesce around urban areas, these transportation alternatives have to be considered as cities look to attract talent, Zielinski. But new modes will continue to be demanded by riders, she said, and there will be missed opportunities. Great piece! Thanks for this important overview of a huge issue. Two quick corrections - Conan Smith is not on the RTA Board of Directors. Alma Wheeler Smith is (who happens to be Conan's mother). And I live in Hazel Park, not Ferndale. And a minor clarification - the RTA has no opt-outs, but that does not and will not change SMART's system. Thanks, Megan. I'll make the fixes. What a shame! For a city like Detroit, mass transit it critical to its continued revival. Local residents want and need it and tourists need it. All thriving, vibrant major cities around the country have had the forethought to put an efficient transit system in place. My hope is the "powers that be" will get over themselves and do what's right for the city rather than continue lining their pockets or greasing their own ways up the proverbial ladder. Here we go again, linking monetary needs to the property tax. Sure, make those in the western suburbs pay for everything, while those that use the system get a free ride. Even worse, many of us are only part-timers in Michigan, and of those who have chosen to take up residency in another warmer state, we don't even get a vote on this matter. Just have the tax shoved up our nose and to heck with what we want or need. I think this is called taxation without representation. If public transportation is so good for everyone, why not levy a tax on all residents of the region where everyone gets to pay the same amount. Or better yet charge ticket prices that reflect the actual costs of operating the service??? Matt: That makes too much sense. Plus it won't garner any votes for the politicians who think up these hair brained ideas. Just a question, but are the upside down Detroit Employee retirement plans that caused so much trouble before all now fully funded at this point? Before picking up a bunch more employees (who I assume also are going to be accruing benefits. Won't they?) Besides being a big kill-joy, I'd like to know as we set ourselves up for the next big city bailout. Matt: I think part of the "grand bargain" was that Detroit does not have to make any retirement payments for 10 years. At 10 years, they have to make some sort of balloon payment. That is the point in time when I suspect the city will again enter bankruptcy. But by then, all of the current politicians will have had time to loot and plunder and set up friends and family plans with golden parachutes, and no one will remember who set this great plan up. Why is it that every time Detroit "needs" something, somebody else has to pay for it? And just how many times do they have to pay? Detroit has been "given" far too much for far too many years, when is it going to grow up and stand on its own? It could make a great beginning by dumping employee retirement programs and starting all over with something that Is far more practical. Additionally, when will the " old gang" be sent packing? Unless more competent, honest people are put in place, there is nothing that can be done to help Detroit. The transit plan is (or will be) for a four-county region, not just Detroit. The question on the other side will be when will a majority in the suburbs realize that the whole region will be better off without the current economic "doughnut hole" design with Michigan's largest city being in the center? Look at Toronto, Atlanta, Chicago. Look where people are moving to live. SB 739 is a necessary precursor to any RTA millage. Sponsored by Wayne Schmidt (R-Traverse City), it caps the millage rate at two, but more importantly, it prevents TIF districts from skimming off a considerable chunk of the revenue the millage will raise. With the huge presence of TIF districts in the four-county RTA footprint, both in number and in size, it's likely a good 2% (at 1 mill, about $3 million a year) of the revenue will be spent on flower pots, festivals, fancy streetlights and SPARK salaries instead of mass transit costs. People in the area already expressed their outrage a few years ago over the Detroit Zoo and Detroit Institute of Arts revenues being diverted for purposes other than those for which voters intended when they passed those millages. DDAs and their ilk need to be told up front, "Hands off!" Besides, as they're so fond of saying about counties, libraries, and everybody else's money they skim: "This isn't money they'll miss, because they never had it in the first place." I don't live in the RTA, but if I did, and SB 739 does not become law, it would mean a "no" vote from me on any RTA millage request.